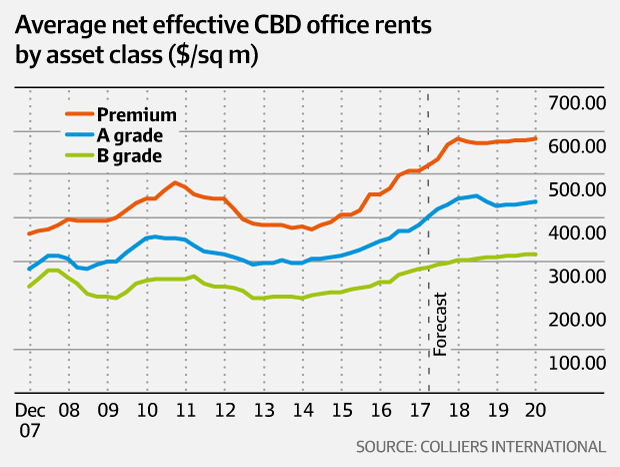 Premium and A-grade office rents in Sydney and Melbourne are set to surge this year as corporate tenants compete for limited space in the country’s two top performing CBD markets, where vacancies site at just 4.6 per cent. Advertised or “face” rents in the Melbourne CBD are forecast to rise by more than 18 per cent this year hitting an average of $763 per square metre for premium space and just under $600 per sq m for A-grade space by July, according to the latest Colliers International CBD Office Market Report. In Sydney, premium and A-grade advertised rents will rise more than 13 per cent annually, reaching $1094 per sq m and $840 per sq m respectively. These increases will be accompanied by a reduction in incentives across the board, pushing up effective rents. Tenants chasing lower-grade space will not be spared with the cost of leasing B-grade office space forecast to rise by more than 10 per cent annually this year in both Sydney and Melbourne. While the forecasts point to a landlord-dominated market over the next few years, the report also highlights the growth of co-working space providers – among them WeWork, HUB Australia and Spaces – which are now competing for corporate tenants and forcing traditional landlords to raise their game. “Our view is that the most significant change impacting office markets currently is occupiers’ drive towards flexibility,” said Simon Hunt, Colliers International managing director of office leasing. “Over the next supply cycle, landlords that proactively met the demand for customer-focused and flexible working environments will attract and retain the country’s top occupiers, and in turn, build the most attractive investment portfolios in the market. “Over the last two years in particular, the relationship between tenant and landlord has become more about customer and provider, as major corporates view their accommodation strategy as a key driver in the changing way they do business, and indeed interact with their own customers,” he said. According to the Colliers report, co-working groups accounted for over 10 per cent of the vacant space leased in Melbourne over the second half of 2017. These include Spaces, a subsidiary of serviced office provider Regus, which took two floors in the T&G Building at 161 Collins Street and HUB Australia, which secured new space at 1 Nicholson Street, an office tower owned by Charter Hall. 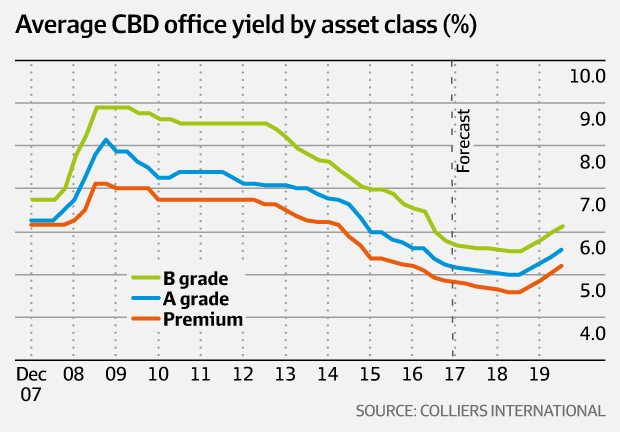 While rents will go up, so will values, with Colliers International forecasting average yields on premium grade assets to fall to a record low of 4.6 per cent in Melbourne and 4.7 per cent in Sydney. In Melbourne, rental pressure should start easing from mid-2019 as new supply comes on board and the vacancy rate starts rising again while in Sydney rental pressures will ease from 2020 when the next wave of supply hits the market, including Wynyard Place, Quay Quarter Tower and Circular Quay Tower. Outside of Sydney and Melbourne, rents are forecast to remain flat or falling in Brisbane, Perth and Canberra, which still have vacancy rates of 16.2 per cent, 19.8 per cent and 11.3 per cent respectively.Despite a high vacancy rate of 15.4 per cent, Colliers International expect Adelaide premium grade asking rents to rise strongly this year as office demand improves. ​Read more: http://www.afr.com/real-estate/commercial/melbourne-and-sydney-office-rents-to-skyrocket-20180219-h0wao2?